Button cover, imitation nickel-plated brass, 18mm round. Sold per pkg of 100. Item Number: H20-2415FN Have a question about this item? 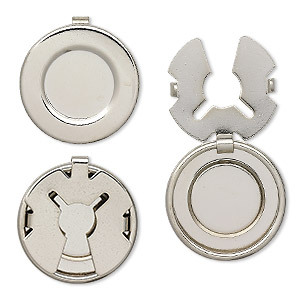 Button covers snap on top of buttoned buttons for quick, interchangeable ornamentation. Smooth tops allow bonding on beadwork, cabochons or any ornaments of choice. Button cover, imitation nickel-plated brass, 18mm round. Sold per pkg of 20.